Go with an authentic Geha Compact 219 projector lamp when it’s time for a replacement. Always look for the seal of approval before buying your Geha Compact 219 projector lamp. This guarantees you are getting an OEM mnufactured lamp that will keep your projector working at its optimum levels. Othwerise, you run the risk of damaging your projector. The Geha Compact 219 needs a Geha 60-283952 projector lamp. putting a generic into your Geha Compact 219 voids your warranty and any tech support. When it’s time to replace your Geha Compact 219 projector lamp a warning sign will appear on screen. Replace the lamp immediately when you see this warning. Other warning signs includes a dark image or one with colors that are faded. Turn off the Geha Compact 219 projector and unplug the AC cord. 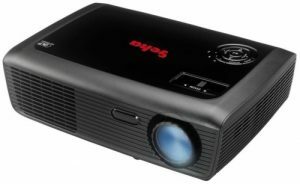 These projectors operate under high temperatures and there is a risk of burning if the projector has not cooled enough. Allow the Geha Compact 219 to cool for one hour. It should be cool to the touch. 1. 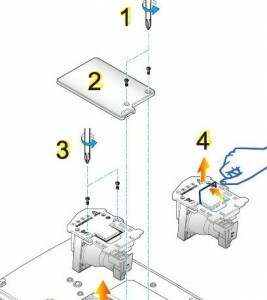 Remove the two screws from the cover. 2. Lift the cover off the projector and place it to one side. 3. Remove the two screws holding the Geha Compact 219 projector lamp in place. screw from the cover. 3. Lift the wire handle on the Geha 60-283952 projector lamp and gently pull the lamp up to remove it. Don’t throw the old Geha 60-283952 into regular garbage as it contains mercury — send it to a local recycling program. 4. Take the new Geha 60-283952 projector lamp using the wire handle. Avoid touching the bare bulb; the oil on your finger can leave a black mark on the lamp affecting the projected image. Tighten the screws on the new Geha 60-283952 projector lamp. Put the lid back onto the projector. Tighten the screw holding the lid in place. Plug the AC cables back into the projector. Turn the project on so you can reset the lamp timer. 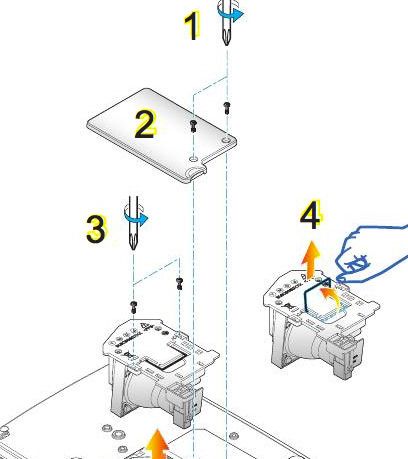 It’s important to always reset the lamp timer after replacing the projector lamp in your Geha Compact 219 projector. You want the projector to track how many hours the lamp has been used and send out warning messages when the Geha 60-283952 projector lamp reaches end of life. Choose Lamp Settings. Press ENTER. Select Lamp Reset to open an additional dialogue box. Use the Eco Mode for more lamp hours. Make sure there is enough airflow around the Geha Compact 219 projector.